So, I did it again. I painted stripes on another wall. Not only just stripes again…. Grey and white, horizontal, 9″ stripes. I’m kind of in love with the ones in my living room. I realized my hallway (right off of my living room) was looking kind of sad. It was previously painted with a flat paint and it just wasn’t conducive to messy little hands. 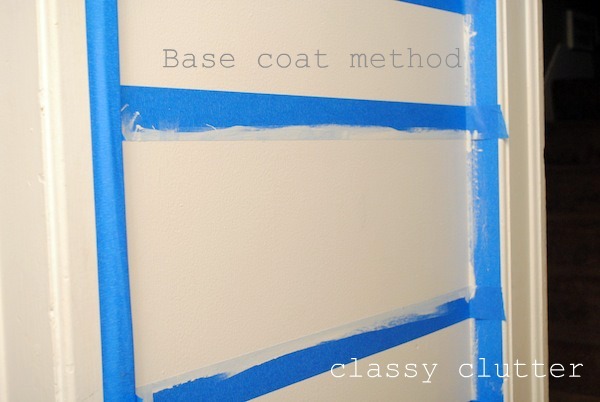 If you’ve ever worked with flat paint before, you know it isn’t easy to keep clean. Especially when it is a really light color. My hallway was cream. It was a pretty color but it just wasn’t working with my two kiddos being 3 and under. No matter what, I feel like they always have something on their tiny (chubby!) little hands. I decided to paint the hallway a crisp white. I used Behr’s Swiss Coffee. Not only did it make the area look lighter and brighter, it really helped to “clean up” the hallway walls. I loved it. I knew I wanted more though. I’m not one to paint a wall all white and be done. I think we all know that. 😉 So….. I opted for stripes. An obvious choice if you’ve known me for more than 2 seconds. I decided that I didn’t want to repaint the entire hall way before we move (since we’re renting) so I only painted the wall that is visible from the living room. 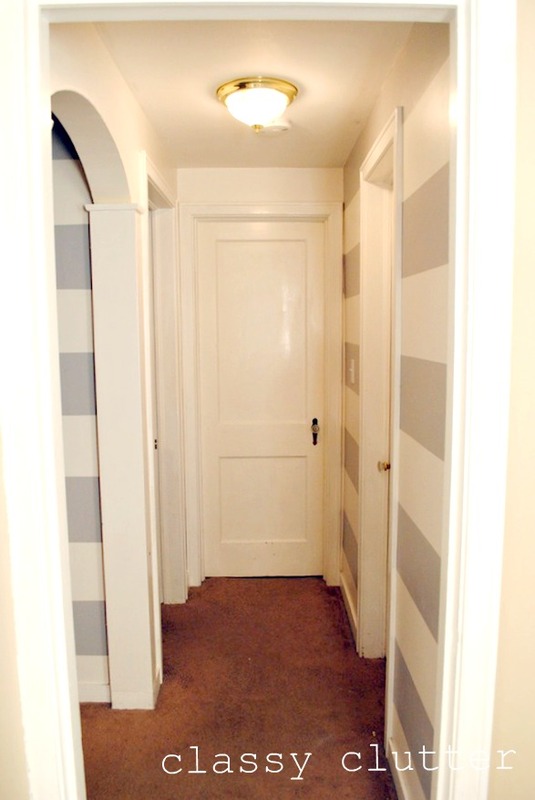 I kept the rest of the hallway plain white so I only have to paint over the grey stripes to make it neutral when we move out. First, I taped off my wall. I wanted to try two different techniques for painting stripes to find the BEST way to get a clean crisp line. I tried the dry brush method I shared with you here. Then, I tried another method I’ve read about where you tape off your stripes then paint over the edges tape with your base color. See my base color was Swiss Coffee (white) so I taped off my stripes, then painted the soon to be grey stripes with a coat of white. When that dried, I painted the grey right over my base coat. This is supposed to eliminate any obvious bleeding underneath the tape. 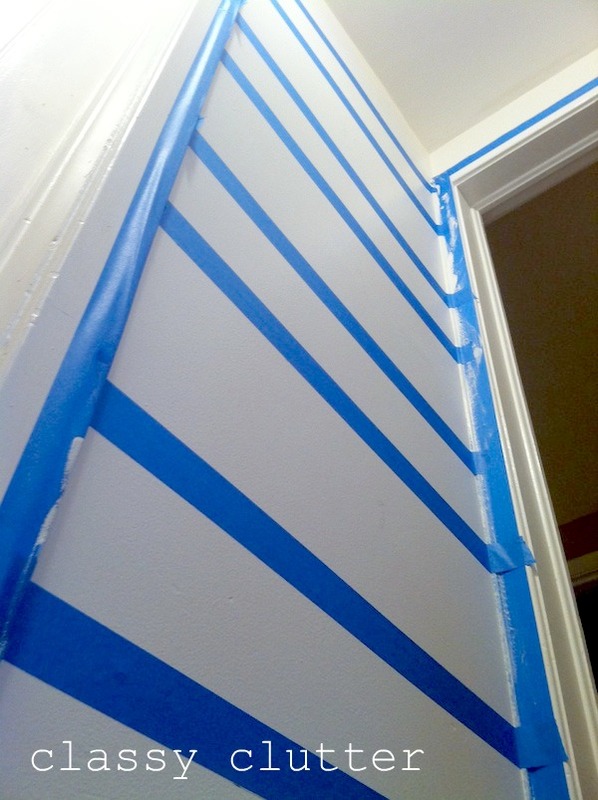 Basically, if the color bleeds through the tape, it matches the base color so it doesn’t matter, leaving you with a clean crisp line. 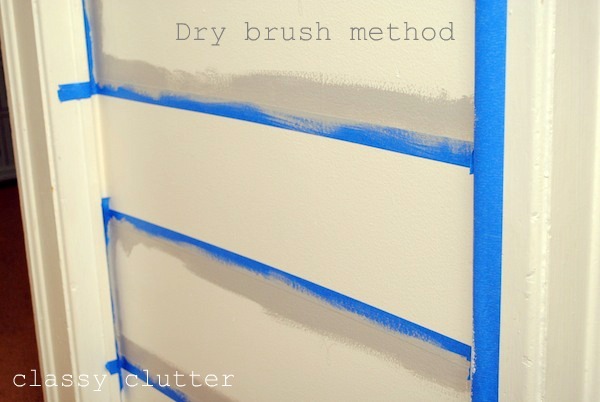 So… dry brush versus base coat method! The verdict…. Both lines look fan-friggin-tastic! No drips, peeling, bleeding, smudging at all! I say both methods work wonderfully so it is definitely a personal choice. I will likely continue using the dry brush method because I didn’t like having to have get my white paint out and then get the grey out and set up. Just a personal preference but they both work really really well! PS. This hallway had this old yellowy-white light switch and plate and against the grey and white wall… it wasn’t working. Then, I had a brilliant idea! Beautimous! I just used a can of white spray paint and painted the switch, plate and screws. My husband couldn’t even believe how painting that old thing made such a big difference. Easy update people! I’m in love with my crystal door knobs. They’re on every door in the house. How fun is that?! Don’t forget to enter our My Memories Scrapbook Software giveaway going on now!!! The easiest way to make the BEST Scrapbook! It looks amazing! I love stripes. Love the stripes! I’m wanting to do this in my LONG, DARK hallway and you have inspired me! I don’t think your landlord is going to want you to remove a thing–you just raised the rental value on this piece of property! It is so cute. Glad I found your blog. I meant to ask what color gray you used. I am looking for a grey to paint a room with, plus to stripe with. Hi Sunday! SO sorry I just saw this question! 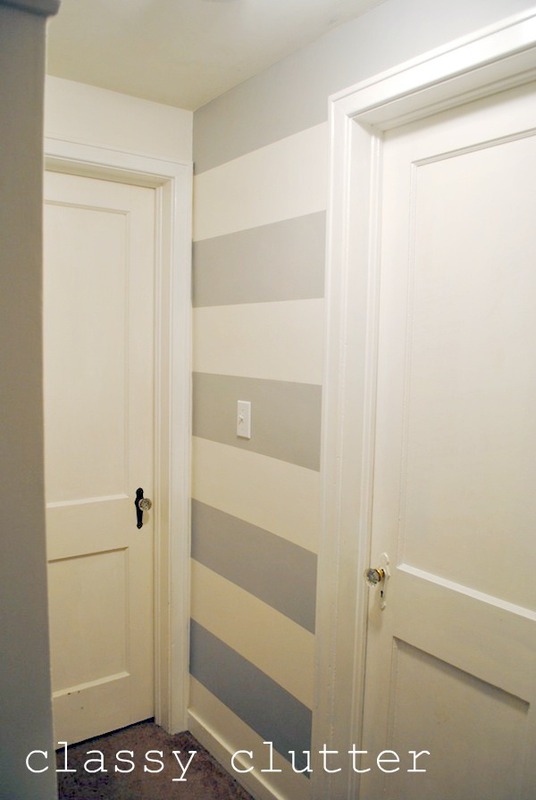 I used Glidden Pebble Grey from Wal-Mart! Thanks so much for your sweet comments! Oh this all looks so great! Thanks for sharing! I love that they aren’t overdone. Your living room is beautiful! It looks so relaxing- I love the stripes!! I love the way it unites the spaces! I think it’s awesome. I totally need to do that to my sockets and switches! We’re obsessed with stripe walls! Next apartment I have, I’m doing the hallway. Stop by Everything-Pretty when ya get a chance! I love your stripes! Love the colors you choice neutral but awesome. Thanks for sharing the tips for doing them. I love those stripes!!!!!!! I wanted to do something like that in my sons room, but well, I was pregnant at the time, so let’s just ay it didn’t happen!! LOL…I am so stealing that spray paint idea for all my ugly yellow switches too!! Thanks for stopping by today, too! Gorgeous! I love that gray color. I love the stripes! They add so much to the hallway! They turned out great, and I love the colors! I love the stripes. 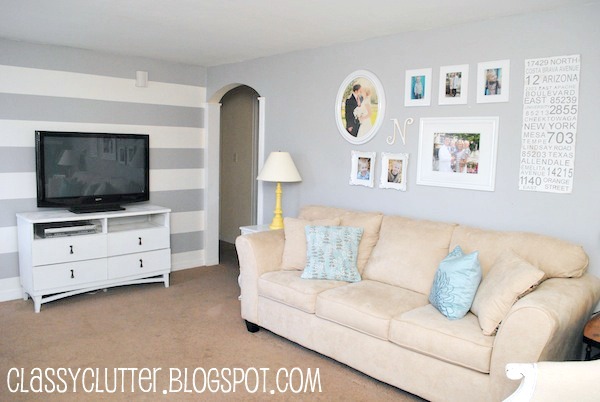 Where oh where can I paint some stripes in my house? Ooooh! LOVE the stripes! I had purple stripes (a gradient) in my bedroom in my last house and I LOVED every minute in it! Really pretty! Looks amazing! Stripes are such an easy way to add high impact! Hope you’ll link up to my newest link party. Wow, I’m loving the stripes in the hallway and the living room is soo cute!! I love your picture wall with the wall art! I’m pinning this for inspiration for my basement! SO helpful, thank you! 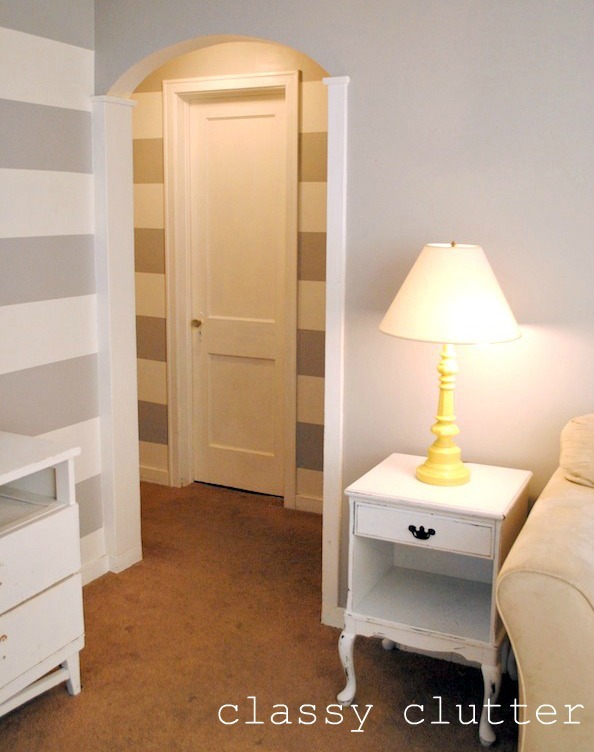 I am painting my nursery grey and white STRIPED! Basically exactly like your walls and have been looking for tips, i not only found the tips but the exact wall. How convenient 🙂 Turned out awesome! How well is the spray painted light switch, plate and screws holding up? I have a house full of the same ugly color you originally had and want to try it if lasts.